The Pacific War Online Encyclopedia: Del Valle, Pedro A.
Del Valle was born in Puerto Rico and graduated from the Naval Academy in 1915, accepting a commission as a second lieutenant in the Marine Corps. He served as assistant naval attaché in Italy and was the sole American observer of operations in Ethiopia. He was one of three Marine majors (the others being Lyle Miller and Charles Barrett) who began drafting the Tentative Manual for Landing Operations in 1931. This document laid the foundation for Marine amphibious operations during the Pacific War. Del Valle attended the Army War College in 1937 and was given command of 11 Marine Artillery Regiment in 1941. 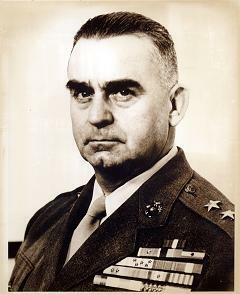 Del Valle commanded his artillery regiment with 1 Marine Division at Guadalcanal. Following a Japanese bombing attack on "Edson's Ridge" on 11 September 1942, both 1 Marine Raider Battalion commander "Red Mike" Edson and Del Valle concluded that a Japanese attack was imminent, and Del Valle spent the next day reorienting his guns and reformulating his fire plans. Artillery fire from 11 Marines would prove crucial in breaking up the Japanese attack on 13 September. In 1943 Del Valle commanded all ground forces in the Solomons. He was commander of III Amphibious Corps artillery during the Guam and Tinian invasions. In November 1944 he was promoted to major general and command of 1 Marine Division, relieving Rupertus, who was in poor health and who had conducted the battle of Peleliu badly. Del Valle led the division through the Okinawa campaign, demonstrating his initiative during the battle of Shuri Castle, when the Japanese left open a gap in their line. Del Valle immediately authorized a company to cross 77 Division's front and seize the castle, then reinforced the penetration with every available battalion. His men were nearly bombed and shelled by their own side, but the penetration unhinged the Shuri Line. Del Valle became inspector general of the Corps after the war, retiring in 1948. He then became vice-president of ITT for the Middle East and later president of ITT for South America. Leckie (1962) describes him as hot-tempered but quick-witted, and Lieutenant Colonel Harold Deakin, who was on the staff of 1 Marine Division when Del Valle assumed command, felt that "The spirit of the division changed overnight" (Sloan 2005). Deaken regarded Del Valle as the best commander he ever encountered in the Corps. Prairie. Participates in Santo Domingo campaign.